In the summer of 2017, somewhere in the north-eastern part of Europe, at the place where north, south, east and west meet, a jamboree will take place. The Estonian National Jamboree! Come and be a part of it! As we Estonians say: friendship and adventure – this is scouting. 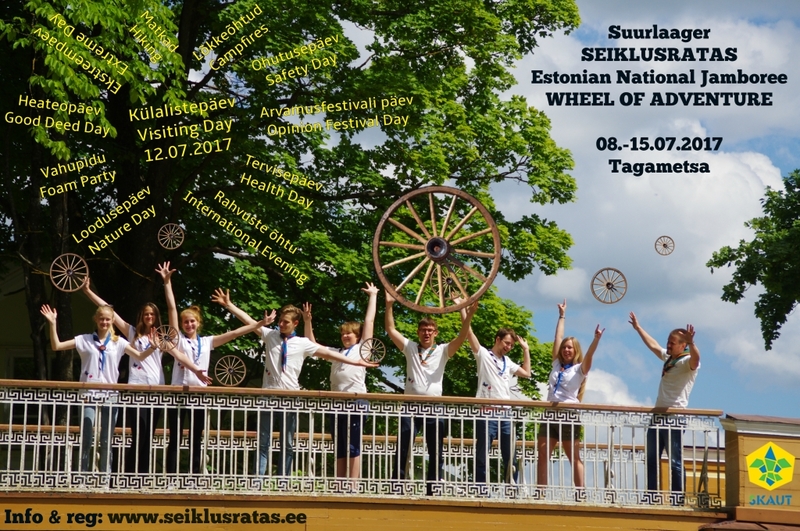 This is our lifestyle and what else is scouting, if not a grand WHEEL OF ADVENTURE or in Estonian – SEIKLUSRATAS! The camp will take place in our camp site which is as if straight out of a fairy tale. The camp site is situated in an ancient forest and in the middle of it is a hunting lodge. This is where our scouting traditions and the cleverness inherent in Estonians come together. Modern day and history. The forest and the castle. Brain and brawn. Spirit and the practical. It will be a special experience for over a thousand scouts and guides from all over the world. PLACE: Tagametsa Hunting Lodge and Camping Center (ca 120 km from Tallinn, in Google Maps “Tagametsa jahiloss, Türi vald”). ACTIVITIES: During the eight days of camp, different activities will take place ranging from the traditional to brand new. Every day of activity has its own name – safety day, opinion day, health day, good deed day, extreme day and nature day. Every day has its own leader who coordinates the activities. Exciting moments are offered by, for example, a Rambo trail and paintball. But this is not all – there is nothing like an opinion festival or laugh therapy or forest yoga to get the heart beating faster. Everyone will find something that they will absolutely adore from the program. As is tradition, there will be many campfires – the opening ceremony, the central great fire and the closing ceremony will all have a grand fire to warm up our souls. There are even 2 separate disco parties where one can dance like crazy. And what would be a camp without a hike? There will be hikes of different lengths ranging from 4 hours to 48 hours. PARTICIPANTS: We await all international participants – scouts and guides – from the age of 12. For every 10 participants there must be one adult leader. Every participant who is 18+ but not a leader, can participate as IST (International Service Team). REGISTRATION: Please write a letter about your own or your group participation (plans) to jamboree@skaut.ee. Personal registration sheet is available in here. Please send your printed and signed forms by regular post to Eesti Skautide Ühing/Estonian Scout Association, PK 260, 10503 Tallinn, Estonia by 15.03.2017 (extended till the 500 participants is registered). NB! Registration is complete when the registration sheet has been submitted with a picture and the camp fee has been received. CAMP FEE: International participants/leaders 01.11.2016-15.03.2017 (extended till the 500 participants is registered) – 200€. The camp fee includes participation, all the meals and activities in the camp, but not the transportation (it will be organized from Tallinn to Tagametsa for the additional payment). IST: The participation fee for IST members is reduced by 50%, meaning 100€. DAILY FEE: If you can’t take part in the camp for the entire time, then you can come for just a few days. The one day fee for is 25€ (includes meals as well as participation in all of the program activities as long as there are free places). This includes the right to stay in camp for 24 hours. REFUNDS: Cancellations prior to 15.05.2017 are eligible for a refund. A written request for a refund should be sent to the head of administration of ESÜ at jamboree@skaut.ee. Later refunds will take place only in extraordinary circumstances, if there is a valid reason for it and is subject to the decision of the head of administration. The Jamboree is an experience of a lifetime! See you on the Wheel of Adventure!